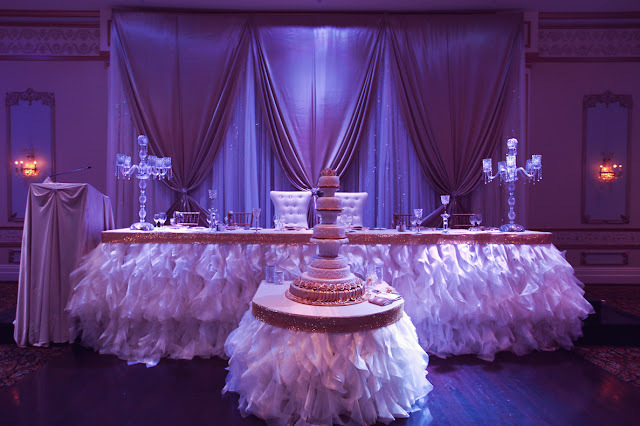 Tamar & Emad tied the knot last Sunday and celebrated with an upscale event at The Venetian in Vaughan. They celebrated the night away with a swanky crystal studded affair. Crystal Chandeliers identified each table and matched perfectly the stemware and charge plates. Gold napkins added a little extra glitz to the already glamourous affair. The couple sat perched above their guests at their immaculate head table. Their modern inspired chairs were accessorized by crystals as well. Their cake was an incredible 5 tiers with beautiful rose art work. Pink uplighting gave the final touch and illuminate their night with just the right amount of flare. Tamar and Emad we wish you all the best! The sun came out shining last Friday, July 20th for Sangeeta and Dino who had a traditional Indian Ceremony and celebrated with a fun style and lots of striking colours. Guests were welcomed to Shangri la Banquet Hall in Markham and were led to the garden first to be greeting by a welcome table with cards and statues. Then they went under a white canopy where they were greeted by all the colours of the rainbow. 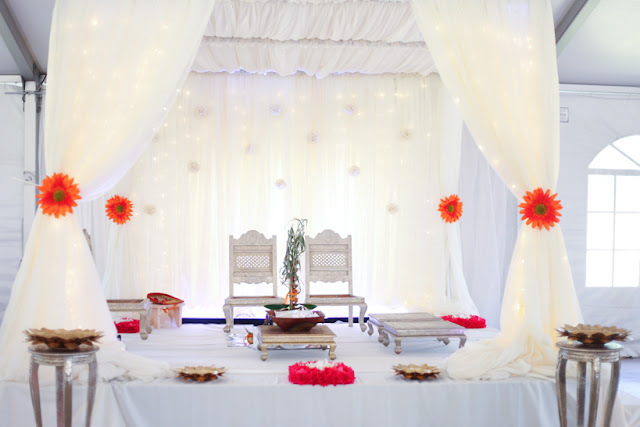 Sangeeta and Dino had a beautiful colour scheme with oranges, reds, pinks and cyans and lots of amazing textiles. Rose petals would guide Sangeeta down the aisle and little elephants adorned their favours. Congratulations Sangeeta and Dino! We think your wedding was as alive and vibrant as you two are!